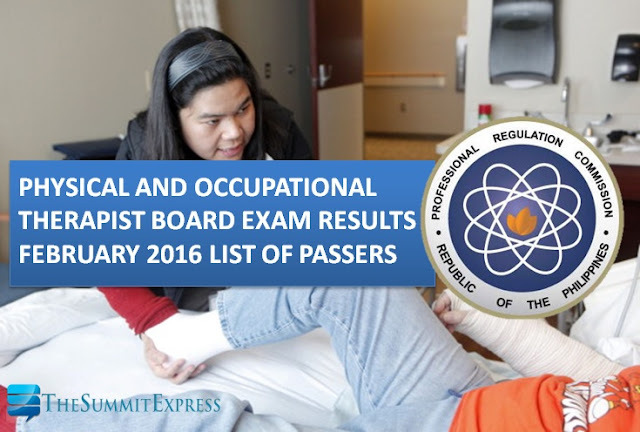 Those awaiting results of February 2016 Physical Therapist (PT) and Occupational Therapist (OT) board exam can find here the full list of passers, top 10 (topnotchers), top performing schools and performance of schools as the Professional Regulation Commission (PRC) officially released the results in 2 working days after the exam. PRC on Wednesday, February 10 announced that 521 out of 912 passed the Physical Therapist Licensure Examination and 55 out of 102 passed the Occupational Therapist Licensure Examination. The Physical and Occupational Therapists (PT-OT) first board exam this year was administered on February 7 and 8 in the cities of Manila and Cebu. Registration for the issuance of Professional Identification Card (ID) and Certificate of Registration will be on February 17 to 19, 2016. Those who will register are required to bring the following: duly accomplished Oath Form or Panunumpa ng Propesyonal, current Community Tax Certificate (cedula), 1 piece passport size picture (colored with white background and complete name tag), 2 sets of metered documentary stamps and 1 short brown envelope with name and profession and to pay the Initial Registration Fee of P600 and Annual Registration Fee of P450 for 2016-2019. PT-OT examination covered the following subjects: basic sciences, medical and surgical condition and pathology (Day 1) and physical therapy applications, electrotherapy, therapeutics exercises and principles rehabilitation and hydrotherapy (Day 2). In February 2015 exams, results were released online in 3 working days. PRC announced that 412 out of 766 passed the Physical Therapist exams while 54 out of 87 passed the Occupational Therapist board exams. In August 2015, official results were announced in 2 working days. PRC named 550 out of 868 who have passed the Physical Therapist Licensure Examination and 107 out of 170 passed the Occupational Therapist Licensure Examination. Like Us on Facebook, Follow Us on Twitter or subscribe to our email list to receive more updates.